Image is everything when it comes to your business. Customers won’t hesitate to judge a company by the appearance of the workplace, so if your tile floors are dirty, then everything in your office will look and feel dirty. Tile and grout floors that are properly cleaned will keep your customers happy and build morale in your workplace. Commercial Tile Cleaning and Grout Cleaning Service in Eagan, MN. The tile floors in your St Paul area business see a lot more traffic than the tile in your home, creating the need for frequent commercial tile cleaning & grout cleaning. This high amount of commercial traffic also makes them more difficult to clean than tile floors in most residential homes. Step 1: Mop the solution onto the floor. Step 2: Machine scrub the tile and grout. Step 3: Mop additional solution onto the floor. 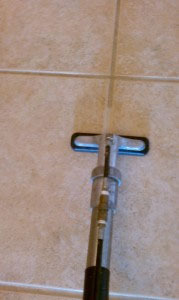 Step 4: Use our truck-mounted grout tool with high pressure and suction to clean every grout line twice. Step 5: Use our truck-mounted tile and grout tool with high pressure to clean the surface of the tile.